This weekend seeing Larne Leisure Centre host the 1st Gaelectric Antrim Championships. The meet takes place over two days and 4 sessions. The highlight being the ‘skins’ events at the end of each session offering £100 for the win. Over 300 athletes from all over Ireland converge on Larne Leisure Centre, including Irish record holders past and present and Irish Champions, for a couple of days of fun (and hopefully fast) racing. Those senior Larne swimmers competing in Dublin next weekend at the Irish Nationals will be using this as fine tuning before the last selection meet of the year while younger swimmers will be looking to qualify for Irish Age groups and post Personal Best times. The 1st event of the day, the 400 IM, got off to a great start with Amy, Sienna, Anna & Amy B all posting lifetime bests. Jamie Clements followed this up with a PB of his wn in th 200 BC. The PBs kept falling in the 100 FLY where Amy McCullagh picked up from qualifying for IAG last week by swimming a huge PB. The junior swimmers from he club took centre stage in the 100 BRS with 8 year old Matthew Allen leading the way. Jamie Clements achieved an IAG QT in his swim. The Woodside sponsored BRS skins up next and again the junior swimmers performed well and Erin Barr progressed into the final at the end if the session. And in the Men’s Backstroke the home team provided 4 of the 6 finalists with Irish Senior Record Holder Conor Ferguson leading the chasing pack. Past club Captain Conor Brines kicked off session 2 with a PB in the 200 FLY winning the event with ease before the girls provided any her marathon event in the 200 IM (18 more heats) no fewer than 15 local swimmers competed in this event. Holly Woodside and Siobhan Baine both knocking over 20 seconds off their previous best times. 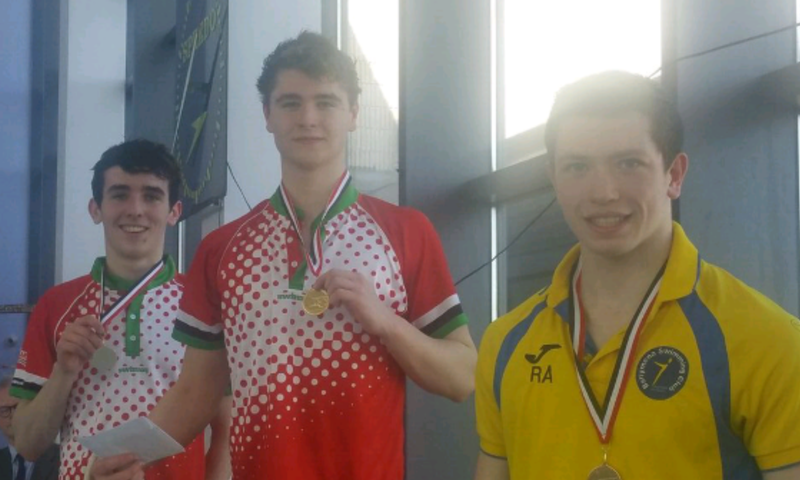 Seven heats of the men’s 400 free produced personal best performances for everyone and culminated in a closely fought race between David Roberts and Adam Mahood with David narrowly taking the win. The 200 BRS was dominated by junior athletes with 8 under 12 making up the clubs entry. The curtain was brought down on the days action with 2 more skins finals. The men’s FLY saw Larne swimmers claim the top 4 spots with Conor Brines just touching out teammate Conor Ferguson in the final shootout while team mate Danielle Hill eased to victory in the 50 Free.